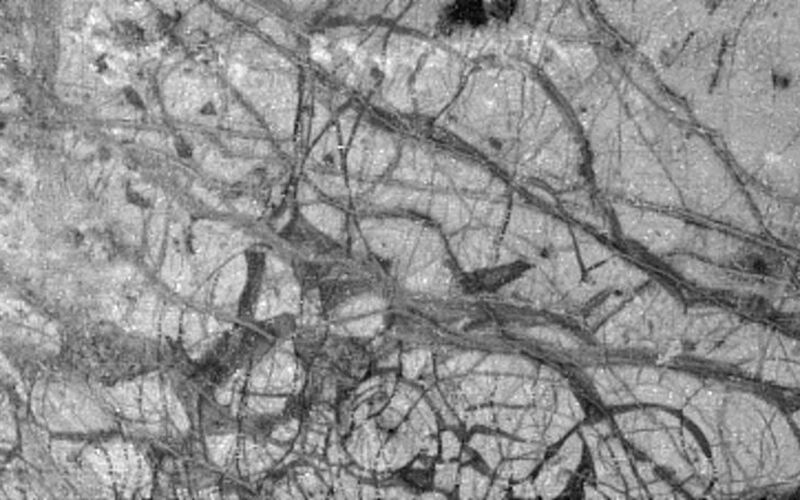 Jupiter's moon Europa, as seen in this image taken June 27, 1996 by NASA's Galileo spacecraft, displays features in some areas resembling ice floes seen in Earth's polar seas. 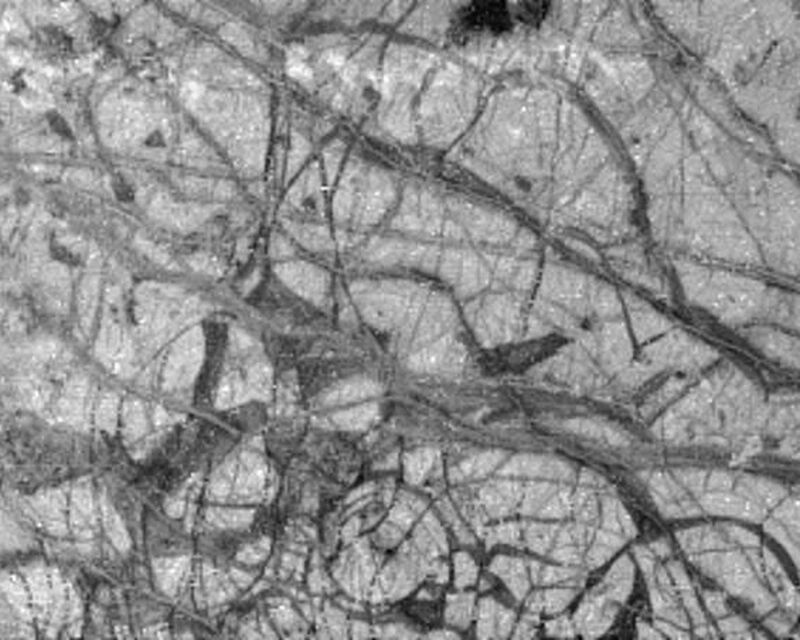 Europa, about the size of Earth's moon, has an icy crust that has been severely fractured, as indicated by the dark linear, curved, and wedged-shaped bands seen here. These fractures have broken the crust into plates as large as 30 kilometers (18.5 miles) across. Areas between the plates are filled with material that was probably icy slush contaminated with rocky debris. Some individual plates were separated and rotated into new positions. Europa's density indicates that it has a shell of water ice as thick as 100 kilometers (about 60 miles), parts of which could be liquid. Currently, water ice could extend from the surface down to the rocky interior, but the features seen in this image suggest that motion of the disrupted icy plates was lubricated by soft ice or liquid water below the surface at the time of disruption. 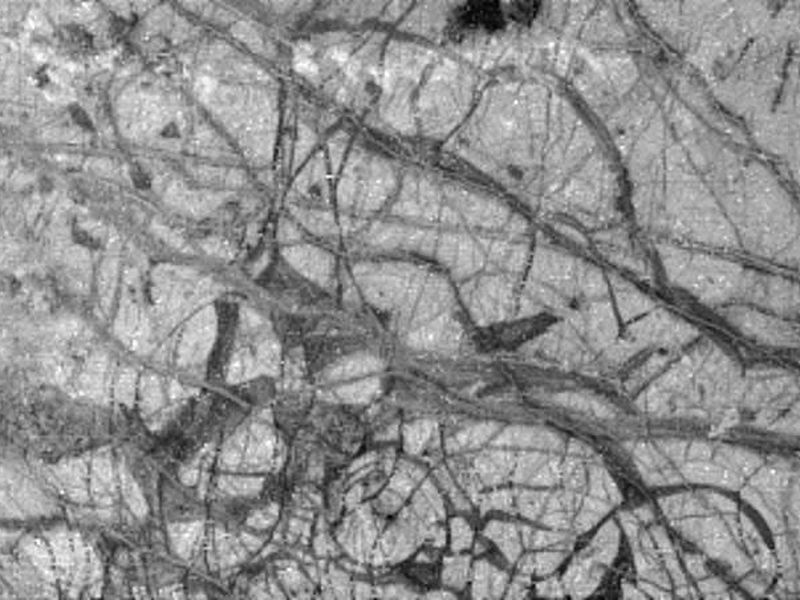 This image covers part of the equatorial zone of Europa and was taken from a distance of 156,000 kilometers (about 96,300 miles) by the solid-state imager camera on the Galileo spacecraft. North is to the right and the sun is nearly directly overhead. The area shown is about 360 by 770 kilometers (220-by-475 miles or about the size of Nebraska), and the smallest visible feature is about 1.6 kilometers (1 mile) across. The Jet Propulsion Laboratory manages the Galileo mission for NASA's Office of Space Science.